Okay, this might be somewhat messy but just look past that, alright? This has got to be the one of simplest designs ever. You don't need any kind of skills to do this. If you want to add a fun twist to your nails, all you have to do is get a dotting tool (doesn't matter if it's the end of a skewer, the end of a bobby pin or a tooth pick or even a pen). I painted 2 coats of each neon polish over 1 coat of China Glaze - White on White. 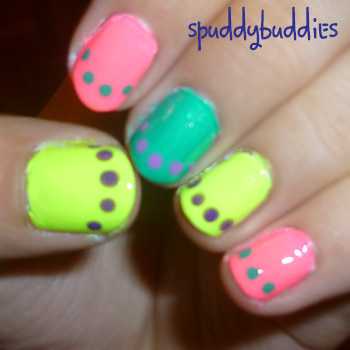 I used my dotting tool to create these dots. 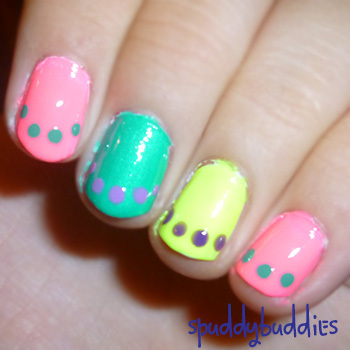 I used China Glaze - Turned Up Turquoise to dot over Sinful Colors - 24/7 and Orly - Charged Up over the other two nails. Easy or what? 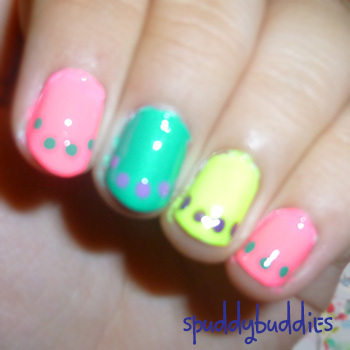 Barely any effort required and your nails will look super cute. These are so awesome! 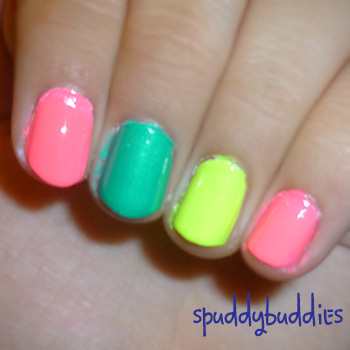 I love the neon - suuuuper cute!